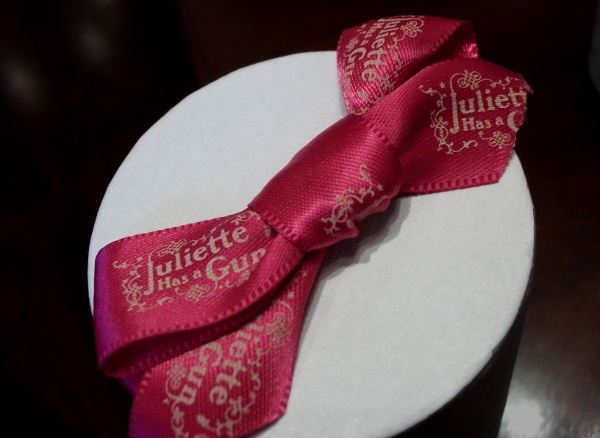 Juliette, the most romantic woman of all time, now has a weapon of seduction - her perfume! Created by Romano Ricci and Francis Kirkdjian, this particular Juliette is a dynamic and modern slant, a new take on romance, conveying the aspirations of modern femininity to balance romantic desire with strength of character. So who is our Juliette? Is she the feisty Lady Vengeance, or the sweet and innocent Miss Charming? Perhaps the mysterious urban vamp Citizen Queen or the go-getter Calamity J ? Well, Juliette is all of these and more. All the facets of her complex personality are here to explore, as the mood takes us, through her range of exquisite scents. At heart however, Juliette remains as we would expect: a deep and irrevocable romantic. The first fragrance for the brand is a cool and powdery romantic scent based around the ever sensuous Moroccan Rose essence, blended with Musk. A scent which leaves a rich and sophisticated wake. While remaining easy to wear, it is the expression of a positive, powerfully self-assured femininity. For this 3rd act, Romano Ricci has insisted on the mysterious side of Juliette. With her very elegant, slightly retro and “ultra” glamorous fragrance, Juliette becomes not only the edgiest lady, or the most intimidating, but all that at the same time. Here is an idea Romano Ricci always wanted to develop ! With his 4th episode, the creator offers the image of a more masculine Juliette, whose desire is somehow to get done with classical Romanticism, escaping the traditional perfume stereotypes: goodbye flowery, sugary and fruity notes, let’s leave room to a new type of fragrance: the masculine scent for woman. is the great-grandson of Nina Ricci (famed creator of the perfume 'L'air du Temps') and at 30 years old is one the youngest creators of scent today. He has personally invested himself into the creation of Juliette has a Gun and devoted many hours over the last three years to perfecting every aspect of the brand, from fragrance to bottle design. is probably one the best known noses in France. At 37, he has already been knighted (created a Chevalier) for his services to French Perfume. As well as 'Juliette has a Gun', he has authored 'Le Male' de Jean Paul Gautier, 'Narcisso Rodriguez', 'Aqua di Parma', 'Diptyque' and other perfumes.